Finally, validation for the Congress president Rahul Gandhi who has been mocked, derided and sneered at by critics, especially the BJP. Exactly a year to the day he took over as Congress president, Rahul Gandhi has two states gift-wrapped and delivered to him and a third on the shelf. The Congress has won in Rajasthan and Chhattisgarh and is locked in a close fight in Madhya Pradesh in the final test of popularity before the 2019 national election. Finally, validation for the Congress president who has been mocked, derided and sneered at by critics, especially the BJP, since the party was reduced to 44 seats in the 2014 national election. The Congress has had few good counting days since. Today's is a rare haul, which Congress leaders right from Sonia Gandhi, happily credited to Rahul Gandhi. Speaking to NDTV at the party office, Sonia Gandhi gestured to her son and successor and said he had worked hard and led the party. "Rahul Gandhi should get full credit. He campaigned a lot and very hard," agreed Congress leader Shashi Tharoor. The 48-year-old addressed 82 rallies during the election campaign and religiously targeted Prime Minister Narendra Modi and the BJP on the Rafale deal, the Nirav Modi scam and other such topics that many said had no mass connect. He tore into PM Modi and controversially said, in rally after rally, "Chowkidar chor hain". His speeches apparently found resonance with the voters but he also focused on optics. Images of his temple visits in every poll-bound state raised allegations of "soft-Hindutva" and Congress' "Hindutva lite" politics. Congress hopes that these results will catapult their leader to a position of reckoning in the opposition bloc ahead of 2019. Congress leader Milind Deora, a former minister, said the elections have changed the narrative from here to the 2019 general election. People had rejected divisive or temple-mosque politics, he told NDTV. "Rahul Gandhi worked very hard, managed to reduce tensions between two generations of leaders and created a unified strategy,"said Mr Deora, who had, after the Congress' humiliating defeat in the 2014 national polls, blamed Rahul Gandhi's advisers. In the past year since Rahul Gandhi took charge, the Congress lost Himachal Pradesh and improved its performance in Gujarat. It lost in Karnataka but formed the government in an alliance with Janata Dal (Secular) or JDS. Today, Congress' motormouth Punjab leader Navjot Sidhu taunted the BJP, saying: "Bure din jaane wale hain, Rahul Gandhi aane wale hain". 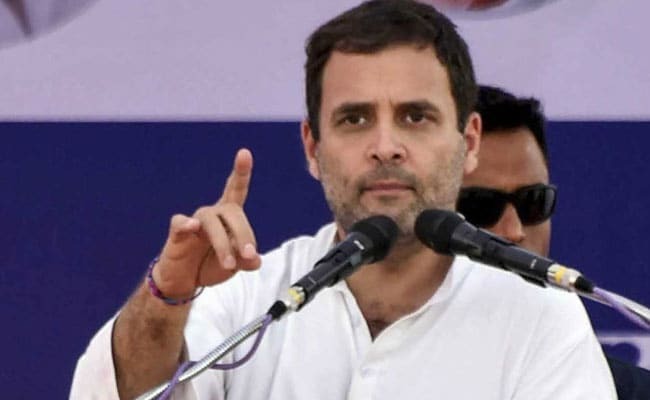 But after the heartwarming results, Rahul Gandhi faces a huge challenge in two seats - Rajasthan and Madhya Pradesh - where it has more than one eligible candidate for the top job.